In this article Sebastian Oberthür and Thomas Gehring argue that a World Environment Organisation (WEO) does not promise to enhance international environmental governance. The authors claim that the establishment of an international organisation alone in a policy field currently populated by regimes cannot be expected to significantly improve environmental governance because there is no qualitative difference between these two forms of governance institutions. This article does not address in detail or extend upon recent proposals for giving more importance to the UN Environment Programme (UNEP) or for upgrading it to a special UN organisation. Furthermore, they submit that significant improvement of international environmental governance through institutional re-arrangement must rely on a modification of decision-making procedures and/or a change of institutional boundaries. A WEO formally providing an umbrella for existing regimes without modifying issue-areas and decision-making procedures would be largely irrelevant. A WEO integrating decision-making processes of existing regimes so as to form comprehensive 'world environment rounds' of intergovernmental bargaining would be largely dysfunctional and prone to a host of negative side-effects. A 'supranational' WEO including large-scale use of majority decision-making and far-reaching enforcement mechanisms across a range of environmental issues might considerably enhance international environmental governance, but it appears to be grossly utopian. In conclusion, a WEO cannot be at the same time realistic, significant and beneficial for international environmental governance. Available political resources should be invested in advancing existing and emerging sectoral environmental regimes rather than in establishing a WEO. The article is available for download at Springer at the price of 34.95€. Oberthür, Sebastian and Thomas Gehring 2004: "Reforming International Environmental Governance. An Institutionalist Critique of the Proposal for a World Environment Organisation". 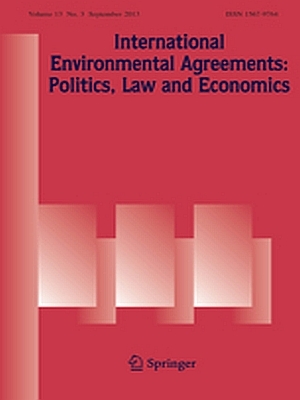 International Environmental Agreements: Politics, Law and Economics, Vol. 4, No. 4, 359-381.